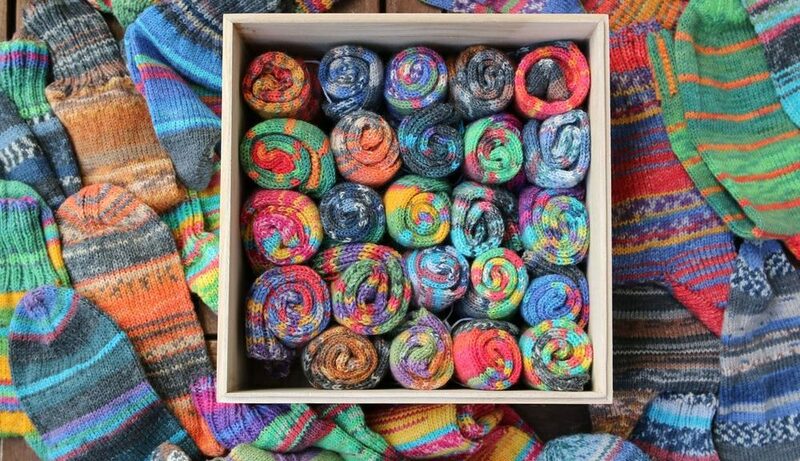 2: My husband was complaining that I never made socks for him (NOT true, but he’s a size 47 and pretty picky, so NOT cool to knit for him, just saying!). 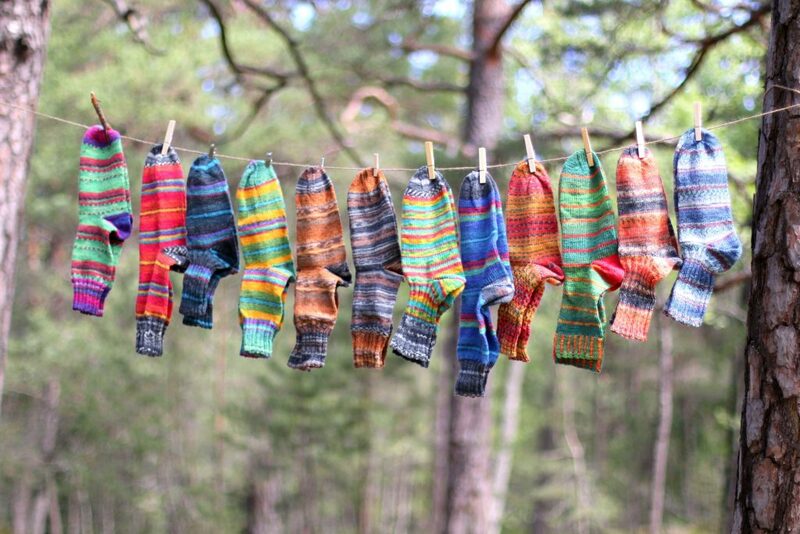 So the obvious solution to both problems was to make a bunch of socks for him. And me, being a pragmatic person and all, combined this with the ever returning challenge to find TWO gifts for Christmas (since that’s also my hubby’s birthday). So the advent calendar idea was born. 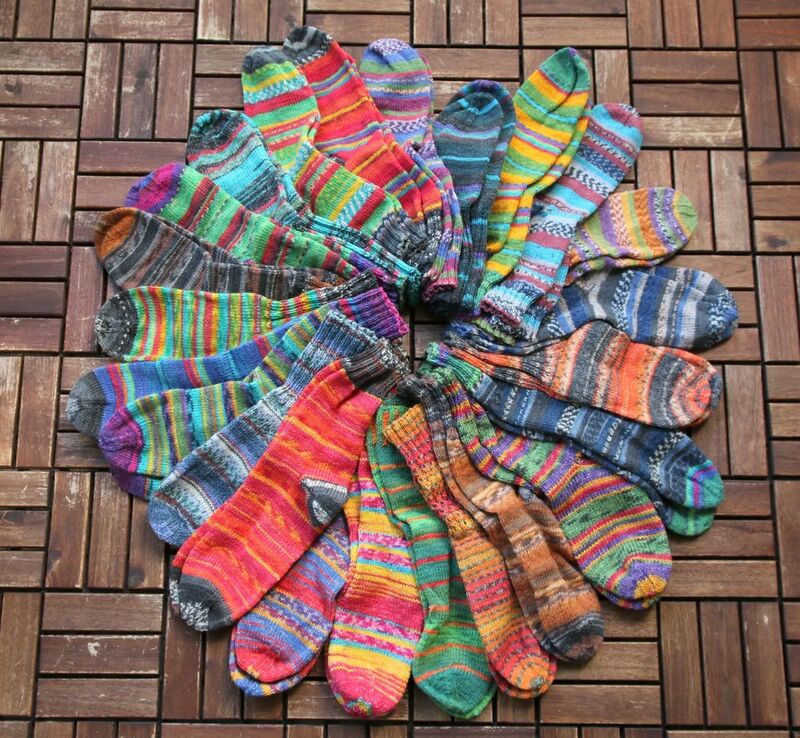 I am quite amazed that it did not take as much time as I initially thought to finish not only 24 socks, but 24 PAIRS in size 47 for him. Only 4 months later my mission was already accomplished! YESSS! Call me a knitting machine! 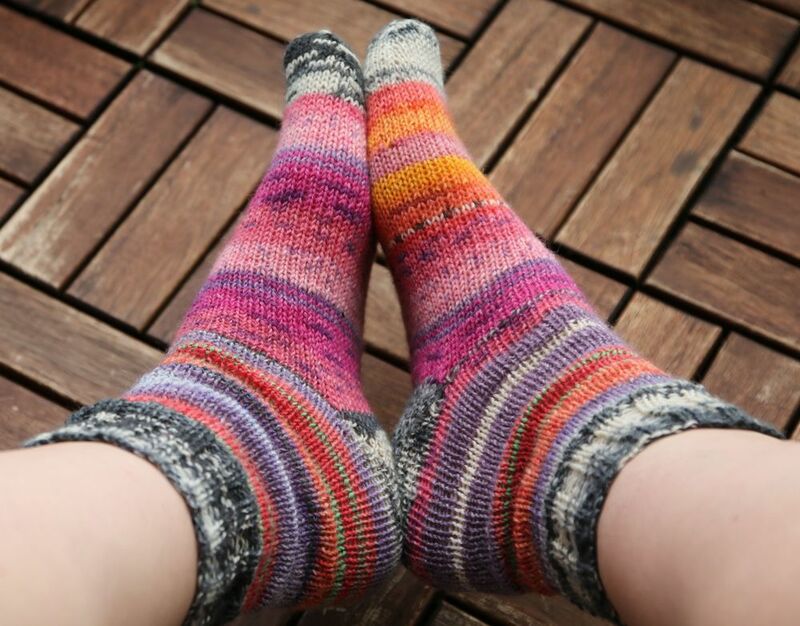 After my Bergfest in June knitting went incredibly fast for some reason unknown to me. 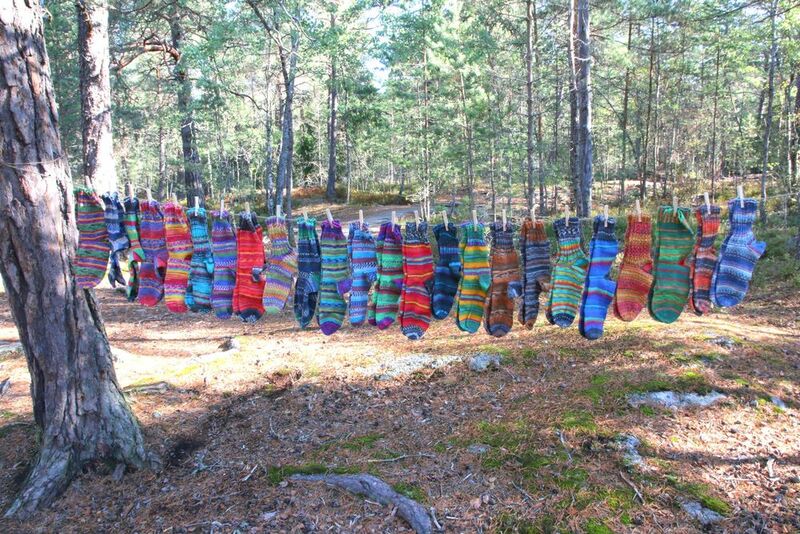 Maybe it was summer with its loooong evenings or just the thought to be able to start something other than socks once I was done or just the incredible colours of the yarns, that made it such fun to go on…? Anyway: here they are! 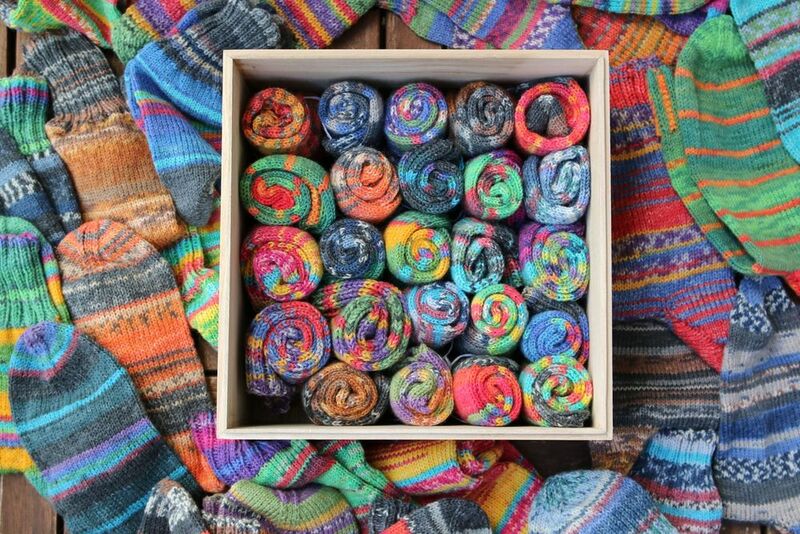 24 pairs of size 47 socks for my husband’s advent calendar! 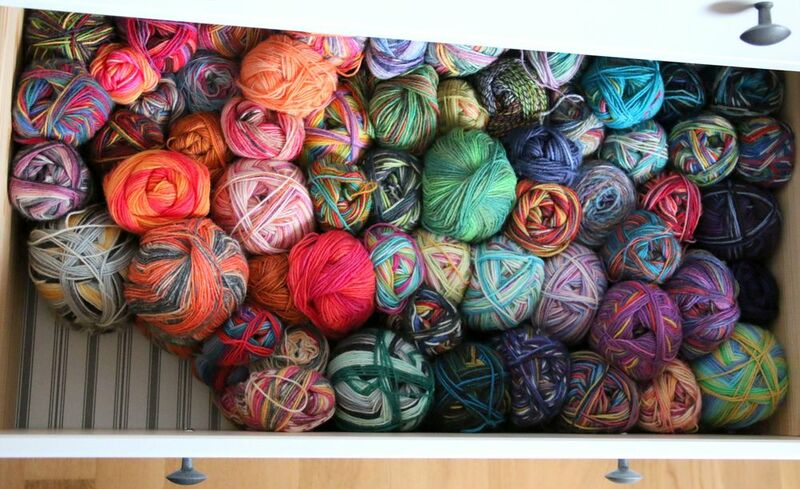 Do you remember the box of yarns that I got for this project? 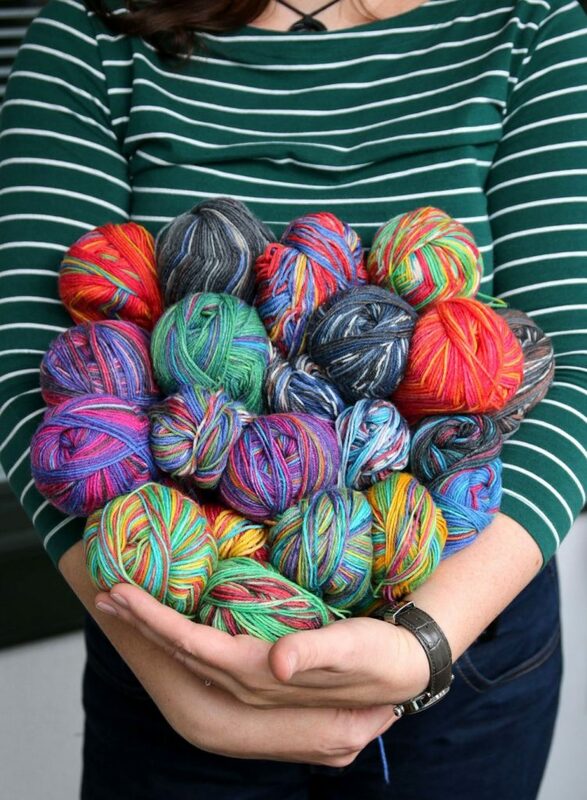 All brandnew colourways of beautiful Opal yarn (read more in the original post here). 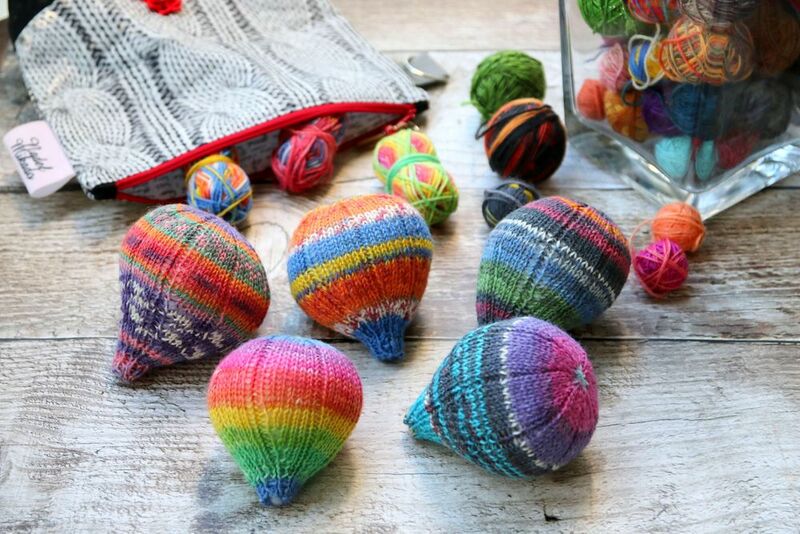 I LOVED working with them, just looking at them makes me happy already, these colours are just what makes me tick. 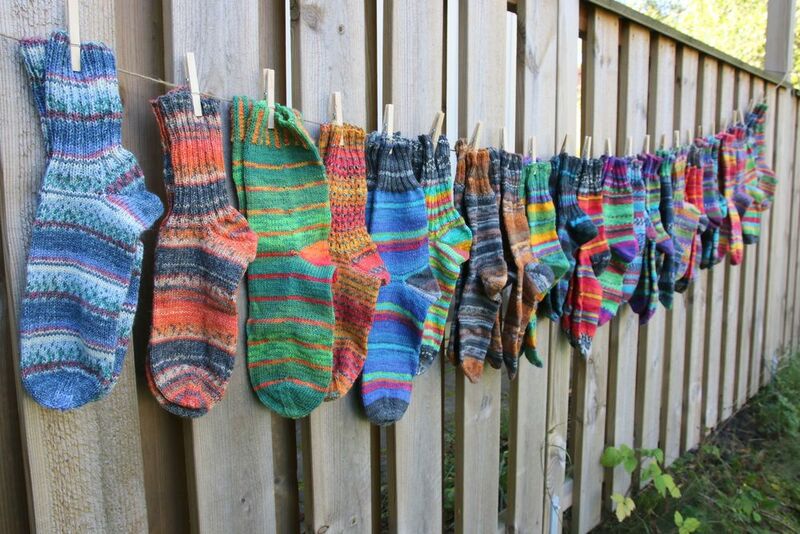 So I guess it’s no surprise that the socks knit up in no time! 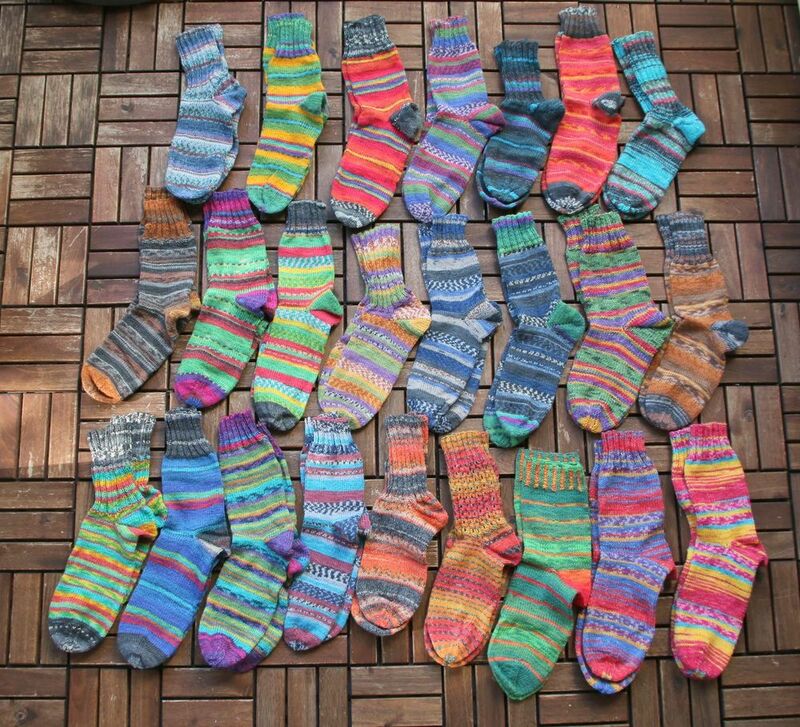 Even as most pairs are plain vanilla socks I think they all have a lot of character, don’t you think? 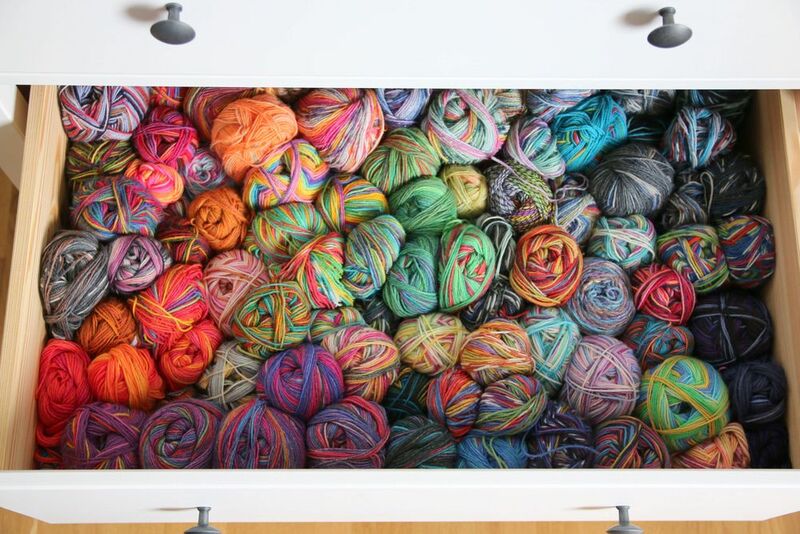 In total I used 2083 grams of yarn for this project. And now? But guess who’s as happy as a clam about these? 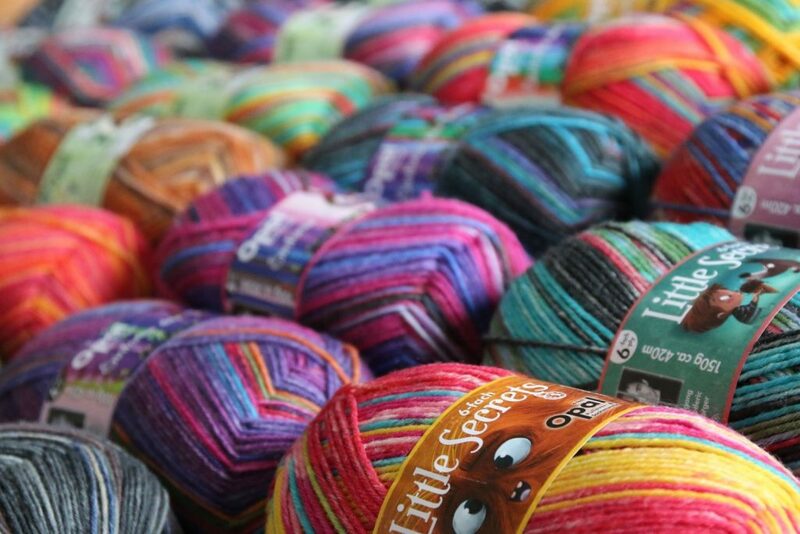 Crafty little Mrsmumpitz – the leftover-noodle! I should do these kind of things more often! oh they’re brilliant, well done!